Apolonia Marutsvaka shows off her drought-tolerant, heat stress maize cobs. 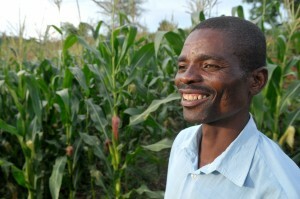 Photo: Johnson Siamachira/CIMMYT. Apolonia Marutsvaka looks triumphant as she shows off one of her three bags of gleaming white maize. She harvested the grain in the midst of a drought and sapping heat that charred many other types of crop. 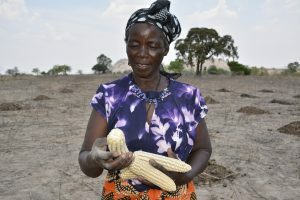 Marutsvaka is hopeful the new variety will continue to ensure her a harvest even as temperatures soar above 30 degrees Celsius here in Masvingo Province and across Zimbabwe. Listen to a podcast of CIMMYT maize breeder Biswanath Das discussing the importance of adapting maize breeding and seed systems to climate change here. 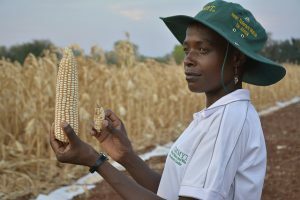 Breeding and seed systems must be adapted to survive projected climate change if major loss of maize yields is to be avoided, a new report shows. Tools that forecast the response of crops to different weather and climate conditions, coupled with crop yield modeling have enabled agricultural scientists to predict and formulate plans for potential future climate change. 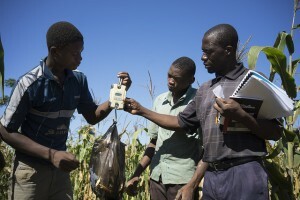 Could conservation agriculture help mitigate climate change? In the densely populated areas of South Asia on the Indo-Gangetic plains (IGP) and Sub-Saharan Africa (SSA), climate change threatens to pose an enormous risk to food security. By the year 2050 both regions are expected to suffer crop yield decreases of at least 20%, with a 40% chance of crop failure for maize in a given season in much of Southern Africa, making a sustainable increase of food production critical in the near future.